We fear that Rob Heron and his merry Tea Pad Orchestra are slacking a bit this month; usually one of the hardest working bands in the North East, Rob and co. are heading out on a mere three date tour cheerily monikered The March March. The band have already notched up gigs in the Netherlands, Belgium and the UK this year (and that was before the middle of February), and if last year’s ridiculous tour schedule is anything to go by, they’ll no doubt be taking their infectious blend of gypsy jazz and western swing on the road on a regular basis. 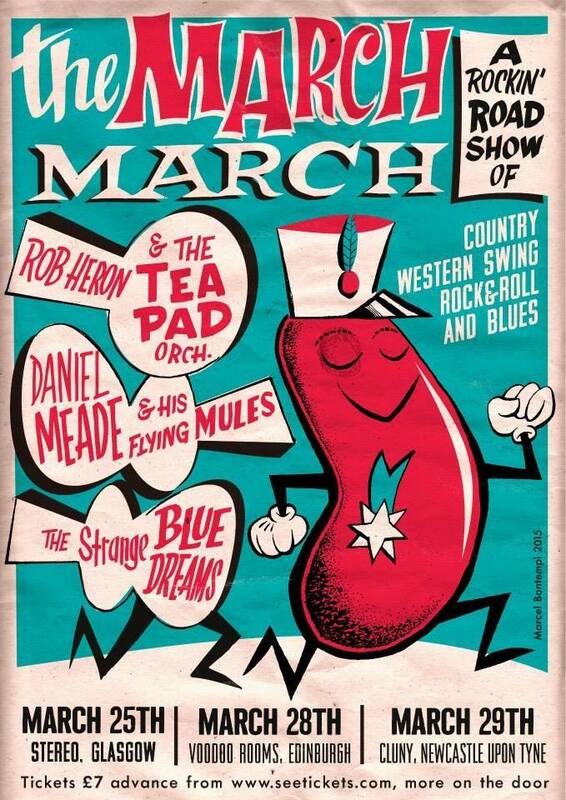 March’s gig, taking place at The Cluny in Newcastle on Sunday 29th March, features the Tea Pad Orchestra themselves playing alongside country, honky-tonk, bluegrass band Daniel Meade & The Flying Mules and Glaswegian gospel rock ‘n’ rollers The Strange Blue Dreams. Rob Heron & The Tea Pad Orchestra, Daniel Meade & The Flying Mules and The Strange Blue Dreams play The Cluny, Newcastle on Sunday 29th March.